It can be debilitating and very distressing, particularly for someone who has never had low back pain before. Several structures in the lower back can be responsible for causing these symptoms, including the muscles, nerves, discs and joints. Lower back pain symptoms can vary from sharp, acute pain with spasm to a more chronic dull ache or stiffness. So if treatment is to be both safe and effective its important to have a thorough examination to arrive at the correct diagnosis. 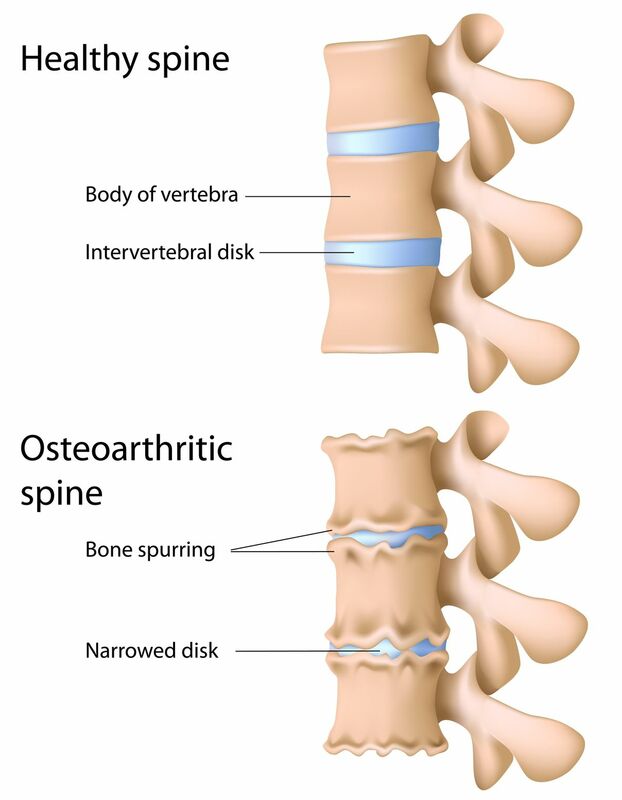 Spondylosis of the lumbar spine may cause lower back pain. What’s causing your Lower back pain? Trapped Nerves – nerves can become trapped or irritated at a number of points in the lower back. Read more. Sacro-iliac (SI) Joint Dysfunction – this is one of the more common causes of lower back pain. Read more. 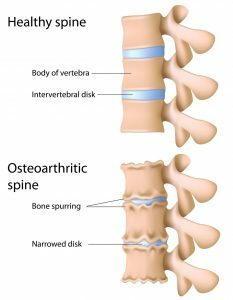 Spondylosis – this term describes arthritis of the spine and is another common cause of lower back pain. Read more. Sciatica – this refers to pain that can spread along the path of the Sciatic Nerve, which travels down the back of the thigh to the foot. Read more. Osteopathy can be highly effective in helping to relieve the pressure on the nerves, muscles and joints causing your pain, through gentle, soft tissue massage, stretching techniques and joint mobilisation. (Osteopathic treatment is recommended by The National Institute for Health & Clinical Excellence (NICE) for the effective treatment and management for non-specific low back pain. If you have had symptoms for more than six weeks NICE advises that your GP should make you aware of osteopathy as an effective treatment option. As well as getting treatment early, getting the right advice about how to manage your back pain while the tissues heal, is also very important. Your Osteopath will help give you advice and tips for looking after your back at home and reassure you about your recovery, how long you can expect it to take and how you can prevent future problems.